What is the name of the currency used in Russia? World War II started in ____. Who wrote the classic: "Adventures of Huckleberry Finn"? Which Hit sitcom featured a song called 'Smelly Cat'? Who sang 'Somewhere Over the Rainbow' in 'The Wizard of Oz'? In the bible, David fought _____. Nicely done!! Your general knowledge is in the 96th percentile. You must be highly intelligent and well-read. And like most geniuses, you’re probably a night owl. Keep up the good work, and share this basic knowledge drill to test your friends. Nice going!! Your score is amazing. 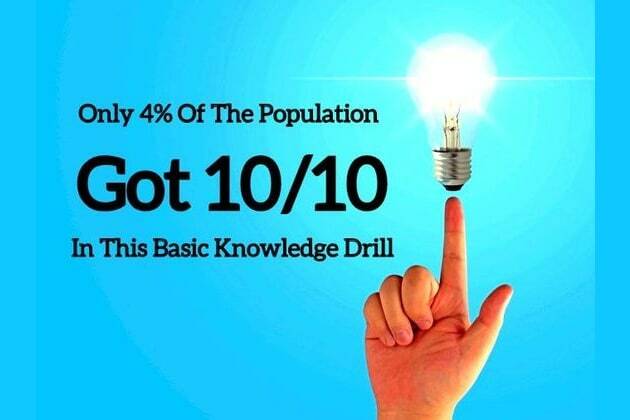 Keep up the good work, and share this basic knowledge drill to test your friends. Give it one more shot, and share it to test your friends. You're in the 96th percentile if you get a perfect score.